I spotted the moth from a distance but was confused as to what was happening until I approached more closely and saw that it had been seized by a spider who seems to have consumed most of the head already. 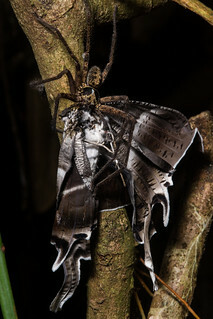 An impressive capture considering that the moth must have outweighed the spider several times over. I'd often come across L. menoetius flitting about at night and I'd often see spiders sitting around, it's inevitable that atleast once in a while their paths must cross. The huntsman spiders do not build nets but rather are mobile and actively hunt their prey, my guess is this moth inadvertently landed close to a well camouflaged spider and that it didn't realize its mistake until too late.